The 4Life-Mad Dog Cycles-Trek racing team usually just focuses on mountain bike events. Typically those that are well organized, on great courses, and of a longer distance to make them challenging yet rewarding. Quite often we get invited by race promoters to participate in road events. While these typically aren’t very appealing to a group of single track enthusiasts we decided the format and location of the Rockwell Relay would be interesting to try so we put together a team to give it a go. Whenever you do a race for the first time it is a learning experience. No matter what beta you get from friends and strangers who’ve participated in the event before, no matter how many race reports you read and how studiously you review the race profile and weather reports, you still run into the unexpected. Nevertheless we prepared as best we could for this 525 mile race from Moab, UT to Saint George, Utah on June 13th and 14th. Here’s how it went. Eager to begin this riding/racing experience we loaded up the mini-van, our only option after exhausting all attempts to secure a large van, sprinter van or RV to use, and headed to Moab at 5 a.m. on Friday morning. Mistake 1 and 2. First, we already were somewhat sleep deprived having arisen much to early for a Friday and then driving 3 hrs to Moab. Mistake #2 was that we missed the Fat Cyclist Bratwurst Fest on Thursday night, which certainly would have given us more energy and the opportunity to rub shoulders with experienced Rockwell Racers and learn a thing or two. But these are the type of sacrifices you make when you have a full schedule of work and family and an early departure is the only solution afforded you. So we went into it a bit blind to the realities of 24 Hour mobile road racing, but hey, we are mountain bikers, we don’t get scared easy. Arriving in Moab we got registered, listened to the pre-race briefing and watched as our speediest teammate, Ty Hopkins, set out on Leg 1 of the twelve segment race. The headwinds were severe and by the time we got ice/water and some snacks and headed out to overtake and support our first rider the field had exploded into fragments of solos and duos struggling against a stiff and steady south wind. We found Ty in the lead group which he vigorously held onto up and down the climbs toward Monticello. This segment is mostly climbing and the headwind certainly made it tougher than it would normally be but Ty came into the transition first with one other rider, an impressive start to a long day. 54 miles done. Allen Parcell took the next segment from Monticello to Mule Canyon. He had 45 miles of riding alone in the lead of the 9 a.m. riders. He dropped the partner of the team that came in with Ty and just rode his pace. He started picking off riders from the 6 a.m. group as well. While the segment had 3,400 ft of decent it also had plenty of climbing but Allen wasn’t caught. arisch took over at Mule Canyon and rode hard against the wind. Some other teams caught up and he was able to work with other riders for awhile. It was hot but he managed to hold a good position as we stopped to transition at the Dirty Devil River. 56 miles was a long ride for late afternoon in these conditions. Keith Payne took over and rode from Dirty Devil Bridge to Hanksville. 45 miles of steady climbing and about equal descending on gradual grades. The crosswinds on this section were pushing bikes 3-5 inches to the right which forced you to ride with a list to port and really give a healthy space on your drafting so you didn’t clip the riders around you by accident. He was able to catch on with an Intermountain Live rider and work together trading pulls to get to the end of the segment. 4 segments down, 200 miles done. With a full moon on tap everyone was eager to continue the race into the night. We knew we were running in the top 2-3 spots for the 9 a.m. start group and battling with teams 55 – Red Rockets and 40 -Logan Bike Club for the lead in the men’s competitive division. We had no idea how the really fast riders from the 12 p.m. start would do so we couldn’t worry about them. Our cohorts from Utah County (Steve Mower, Amy Williams, Mark Nelson and Jeff Jarvie –SBR/3B Yoga Coed Team) were leap frogging with us throughout the race as well and it was great racing with them. They were battling for the top Coed team spot and couldn’t let up either. Night riding has its own challenges and we had only ever experienced it while doing 24 Hour mountain bike races. But with good lights and cooler temps everyone felt more comfortable than expected and did well throughout the night. Ty blasted through segment 5 and retook the lead. Allen made and impressive climb over Boulder Mountain in the middle of the night, dodging deer and elk on a fast descent to hold a 3 minute lead on our closest rival. Danny hammered to Henrieville and descended the scary Hells Backbone area like a Pro and we were still leading by a slight margin. for the 4Life/Mad Dog Cycles team. Keith climbed past Bryce Canyon NP in 30 degree temps and was caught by our SBR/3BYoga coed friends and team 40 – Logan Bike Club. So much for our slight lead. Work still to do. 4 segments still to go. The gap wasn’t big enough as the leaders were all caught again by Ty on the climb up to Duck Creek. 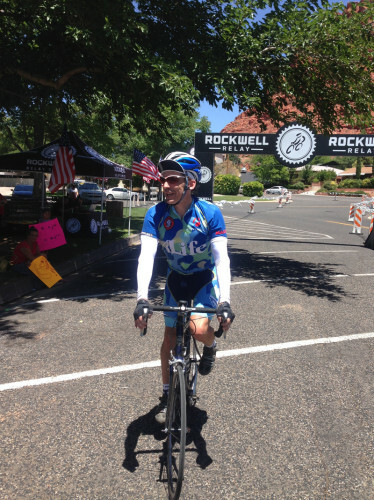 Allen climbed 1,000 ft then descended almost 5000 feet to Cedar City on Segment 10 and kept a slight 3 minute lead. Danny battled to hold the lead out to Enterprise but the Logan Bike Club rider caught on and they worked together to the end of segment 11. The last transition had Keith ride out with the Logan rider and it wasn’t long until he got dropped on the first climb. He hammered as best he could with the wind and finished the 37 mile segment in 1:28. In the 9 a.m. start group, we finished 3rd with Logan Bike Club arriving first and our friends from SBR/3B Yoga in second as a coed team. In the final standings, we finished 7th in the Men's Competitive division and 8th overall. Not a bad showing for our first go at this race. 28 hours and 5 minutes of pedaling, suffering, hydrating, eating and laughing in our delirium. We had a great time! But wow were we tired. No sleep and hard efforts really take its toll in a race like this and we opted to drive home that afternoon rather than crash in St. George and recover. It’s fairly obvious that a race like this will be challenging – lots of riding, little sleep (if any) and constant travel. Operating out of a vehicle is also not without issues. Our Utah County friends had an RV with a driver and a masseuse, hardly an even playing field. What made this race even more difficult was first the headwind/crosswind which we really never fully escaped. The temperature swing from 90 degrees F to the mid 30,s also make it unique. And elevation is always a factor when climbing over 9000 ft.
From an organization perspective we were a little disappointed. The transition zones had individuals with IPads tracking the transition time, but it wasn’t always clear who these people where or where they were standing/sitting. That made it difficult to ensure you weren’t missed. The transitions were chaotic due to all the vehicles and riders and occasional tourist traffic traveling past. They also had to deal with the wind blowing away everything they had unless it was bolted down. But somehow it all worked out. The biggest challenge is that the timing system wasn’t very functional so you didn’t really know how you were faring compared to other teams from the 6 a.m. or 12 p.m. start times. We had some sense of where we were with our own group but it was not an accurate guess and was based on our own split time estimates as we sat on the side of the road clocking riders as they passed. What’s the take away? 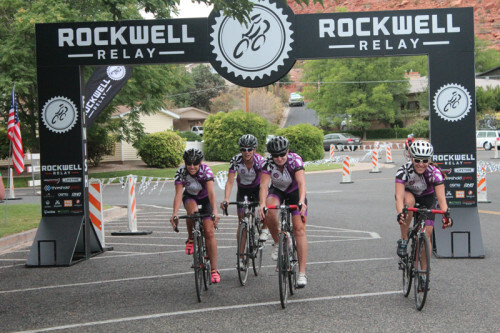 The Rockwell Relay is a unique race: great route, good roads, challenging segments. Whether you are a Pro or amateur it can be a great challenge for you and your team to complete. Logistics and equipment are essential as well as confidence riding 40-50 mile segments on the desert and mountain back roads of Southern Utah. Some areas had heavy traffic with semis and busses, while others were very lightly travelled with only the occasional tourist vehicle. The scenery is, as you would expect, spectacular, and it’s unfortunate that you miss some of it while riding through the night. But the full moon did make for some memorable night riding vistas. This race will likely have to stay at the size it is due to the logistics of moving so many riders and vehicles through these sections of road on the same day. But it’s a great experience and definitely a bucket list worthy event if you have a road bike and 3 semi-sane friends willing to load up the mini van and give it a go. But if I were you I’d find an RV and a driver and a masseuse and ride it like rock stars!